Big Day Friday-What Does It Mean? Big Day Friday-What Does It Mean? Big Day Friday- What Does It Mean? Market State 8A – (16 days) Transitional/Bear Market State: The Portfolio Thermostat has been in one of the “Transitional/Bearish” Market States for the last 73 trading days, shifting to a Transitional Market State on August 20th, 2015. Canterbury Volatility Index (CVI 82) – Neutral: The wild swings on Thursday and Friday caused the CVI to increase 4 points (a 5% increase). A volatility reading between CVI 75 and CVI 90 is considered to be a Neutral reading when combined with the current declining trend, which has continued falling since the September 8th peak of CVI 115. Overbought/Oversold indicator (45% Oversold) Short term - Neutral: There was only a 2 point change in this indicator for the week. An “oversold” (bullish) reading of 95% or higher is considered to be an extreme level. 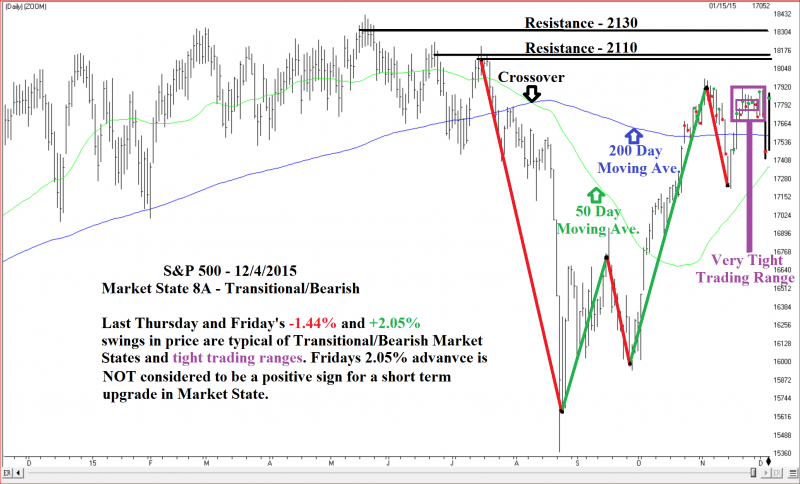 Transitional/Bearish Market States follow the more stable Bullish Market States. With the exception of Transitional Market State 6, the value of a security or index will be below the 200 day moving average and/or the 50 day moving average will be below the 200 day moving average. Please see the moving averages on the chart below. Short-term price swings are typically wide and fast. It is normal to see substantial upside advances following substantial short-term declines. Most investors are not accustomed to wild short-term swings of the Transitional phase, and skittish investors will be quick to react in the direction of the most recent move. The spring was released with a pop on Thursday and Friday. Thursday saw a 1.44% decline followed by Friday’s rare 2.05% gain in the S&P 500 (the Dow was down 252 points and then up 370 on Friday). A one-day gain greater than 2% is NOT a bull market characteristic. In fact, there have only been four 2% plus days during Bullish-Market States with volatility below CVI 90 in over five years. The biggest up day was 2.54%. Keep in mind that each of the 40 days that were up 2% or more were shortly followed by new lows. Because market environments are variable, the risk/return relationship in financial markets and securities is also variable. 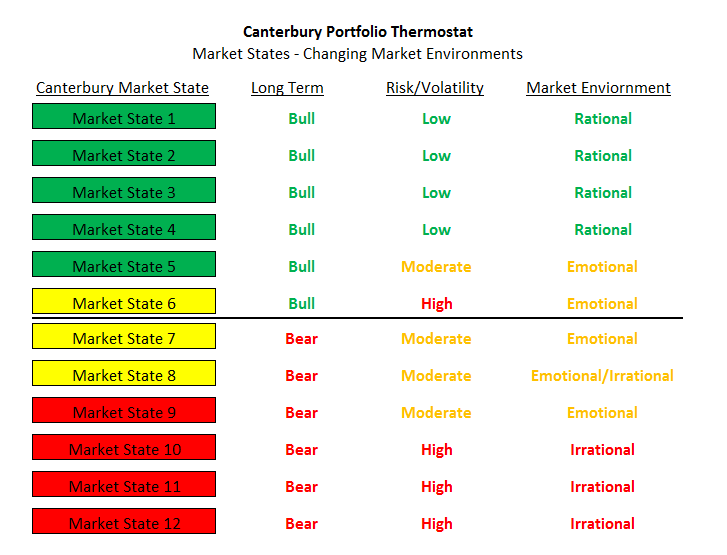 In Bullish Market States, Canterbury’s evidence-based studies show that risk is typically an 8% to 12% correction from the peak. During such times, it would be prudent to hold a high percentage of equities in a conservative portfolio. Transitional and Bearish Market States, on the other hand, are more unpredictable and have substantial risk. For example, during the Oct. 19th, 1987, stock market crash, the S&P 500 dropped 20.5% in one day. There was a shift from Bull - Market State 5 to a Transitional - Market State 6 on October 9th (6 trading days prior to the crash) and then to Transitional/Bearish Market State 12A on October 15th (2 trading days before the crash). This is just another reason why we take Transitional Market States very seriously. The key to a successful long-term investment program is the ability to compound returns. Compounding requires portfolio stability and efficiency. The objective should be to limit short-term declines to the range of a normal “market correction,” defined as a 10% decline from the peak. Risk management must therefore be the primary focus when in Transitional or Bearish Market States because sustainable gains will typically occur over relatively short periods and in Bullish Portfolio States. The Portfolio Thermostat’s job is to maintain a Bullish Portfolio State, which it accomplishes by adjusting ETF holdings to match the market environment.